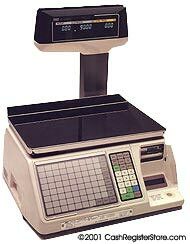 TEC SL-9000 ESB Electronic Weight Scales at Cash Register Store.com. TEC's affordable model 9000-ESB is the latest addition to the SL-9000 family of scales. Single or multi-range weighing accuracy and as many as 25 printing formats for high visibility merchandising in your meat and deli case. 140 speed keys for commodity selection, LCD display for operator verification and print capability for ingredients, nutrition, safe handling and graphics. Entering the "SYSTEM" Menu provides you with access to many diagnostic features. Among these features is the "Diagnostic Data Printout." Selecting this option will provide a printed lable with information, such as, Main ROM number, RAM capacity, Calibration setting, Thermal head resistance, Label sensor data, Maintenance count of label FEED, PRINT and COUNT along with all initial settings of the scale. All this information without taking the scale apart.